Lubricating Systems in Which High Consistency Grease Can Be Used | Overview | Daikin Lubrication Products & Engineering Co., Ltd.
A single line lubricating system (LUBYACE) is a “single-pipe progressive operating type” lubricating system comprising a pump, distributing valve and a single branch pipe. This system reliably supplies “NLGI consistency #2 grease,” the ideal lubricant for the various bearings used in machine tools, industrial facilities, dump trucks and other transportation vehicles, under pre-determined conditions given in the system specifications and piping plan. As this is a single-pipe progressive operating type branch system, the main supply line piping consists of a single pipe, and as a result keeps the piping plan very simple. The downsized design of the distributing valves makes them lightweight and compact. This makes installation work and handling easier. Operating status can be checked visually on the operation indicator supplied with the distributing valve. Blockage and damage to the main supply line (branch supply line) can also be detected electrically by attaching a detection switch. The lubrication cycle also can be checked. Grease cartridges have been adopted for replenishment of grease. This means that operators can keep their hands clean and that contamination with air and foreign matter can be prevented. Grease cartridges can be attached easily by means of a screw-in mechanism. A diverse range of system plans can easily be formulated as there is an extremely wide range of pumps and distributing valves to choose from. *Be sure to use this lubricant indoors. The grease used is NLGI consistency #0 to #2 for centralized lubrication. The grease used shall be unworked and have consistency of 240 or more at the operating temperature. *Before using a lubricating oil with an oil viscosity of ISO VG100 or more, consult with us. The LUBYACE system comprises a pump, distributing valves and piping. Lubricant is fed from the pump to operate the pistons of the distributing valves sequentially by metered operation to reliably lubricate the lubrication points. There are two basic types of distributing valve connections, the 1-stage distributing valve system and the 2-stage distributing valve system. Systems are configured by applying these basic types to match the number of bearings (number of lubricating ports), piping and other factors. 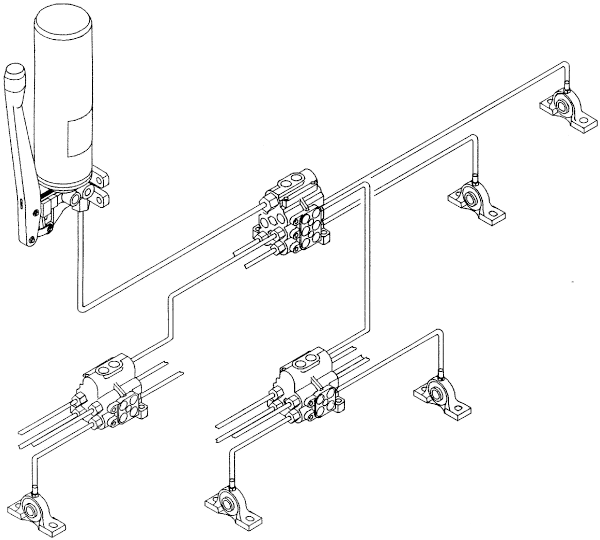 • 1-stage distributing valve system ... Lubrication is performed at a maximum of 12 ports with one distributing valve connected to the pump. • 2-stage distributing valve system ... Lubrication is performed at a maximum of 144 ports with a maximum of 12 2-stage distributing valves connected to the 1-stage distributing valve. Note, however, that with this system, the number of lubricating ports is set to an appropriate number of around 40 ports. When the four pistons are at the positions shown in the figure, piston a moves to the left to discharge specified quantity of lubricant to discharging port 4 when pressure is applied from supply port IN. The next piston d moves to the right to discharge a metered quantity of lubricant from discharging port 7 from the passage that opened by movement of piston a. Likewise, pistons c and b move successively to discharge metered quantities of lubricant from discharging ports 2 and 5. Pistons a, d, c, and b successively move completely symmetrically to the above operations to successively discharge metered quantities of lubricant to discharging ports 8,3,6 and 1 to complete the lubrication cycle.